Greg Colbrunn went 3 for 5 with one mammoth home run in this August 2002 game for Arizona, according to The Associated Press. That home run flew 468 feet onto a pavilion, tying it for the second-longest at Bank One Ballpark, The AP wrote. "It's nice, but it only counts as one run," Colbrunn told The AP afterward. "It's nice to hit a ball like that and see how far it goes, though. This is my fourth year here now and I try to go up there in BP every once in a while." By that point, Colbrunn's career had gone as far as his 11th season in the majors. By the time he was done, he had time in 13 seasons, a career batting average of .289 and 98 career home runs. 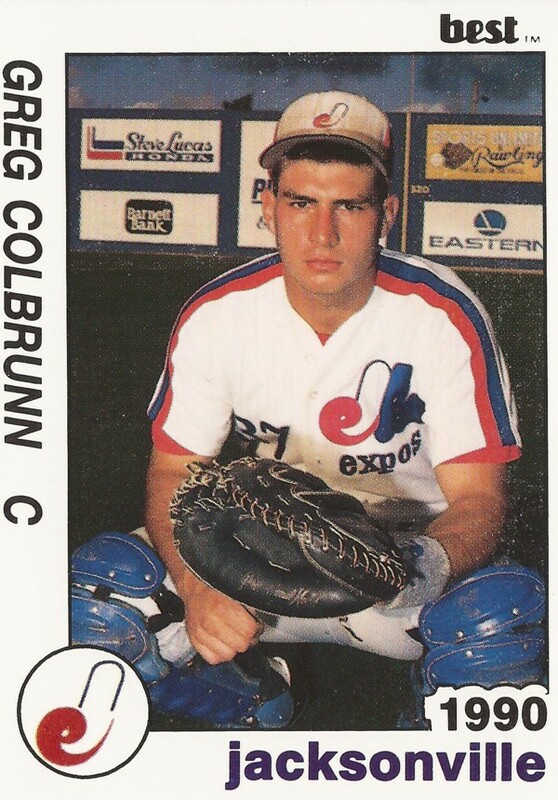 Colbrunn's career began in 1987, taken by the Expos in the sixth round of the draft out of Fontana High School in California. Colbrunn started at single-A Rockford in 1988. He made AA Jacksonville in 1989, returning there for 1990. He missed all of 1991 to injury. When he came back from that injury, he soon made the majors. 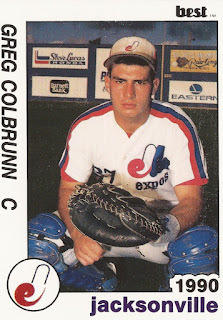 Colbrunn debuted with the Expos in Montreal in July 1992. The catcher got into 52 games, hitting .268 while knocking two home runs. He returned to the Expos for another 70 games in 1993 with a .255 average. He moved to the Marlins for 1994. In 47 games there, he hit .303. In June, he had an eight-game hitting streak going. "I'm still missing some pitches I shouldn't be missing, but I'm happy with the way I'm swinging the bat," Colbrunn told The AP after he extended his streak to eight with a home run. With the Marlins in 1995 and 1996, Colbrunn had career years. He hit 23 home runs with 89 RBI in 1995 and 16 and 69 RBI in 1996. After going through the Twins, Braves and Rockies, Colbrunn arrived with the Diamondbacks for 1999. He hit .326 in 67 games in 1999 and then .313 in 116 games in 2000. Colbrunn only got into 59 games in the Diamondbacks' run to the 2001 World Series. But he did get into Game 6, going 2 for 5 in the Arizona rout of the Yankees. In 2002, Colbrunn hit a total of 10 home runs, including that grand slam. In September, he hit two in a game where he hit for the cycle. A ninth-inning triple sealed the feat. "We were all screaming, 'Go, go, go,' from the dugout,"Arizona manager Bob Brenly told The AP of that triple afterward. "I don't think Colby would have stopped if we'd have put a barricade out there at second base. He was going to try for three and I was really happy to see him make it." Colbrunn ended his major league career with 22 games with the Mariners in 2003 and 20 back with the Diamondbacks in 2004. His playing career over, Colbrunn turned to coaching. From 2007 to 2012, he served as coach or manager with single-A Charleston. For 2013, he was named hitting coach for Boston, a job he continues in for 2014. He then helped coach the team to the 2013 World Series title. For 2016, he's serving as hitting coach for the Charleston RiverDogs. "It wasn't something that guys hadn't done before," Colbrunn told The Charleston Post and Courier after his team's series win, "and the one thing we talked about in spring training was 'Be who you are; don't try and be somebody you're not.'"